The International Union of Bakers and Bakers-Confectioners (UIB) declared the 16th of October as World Bread Day. So Zorra from Kochtopf is hosting a “World Bread Day” blogging event. Although, I didn’t bake a loaf of bread for this event. I wanted to share the challah bread that I have been enjoying almost every Friday since I moved to Toronto. 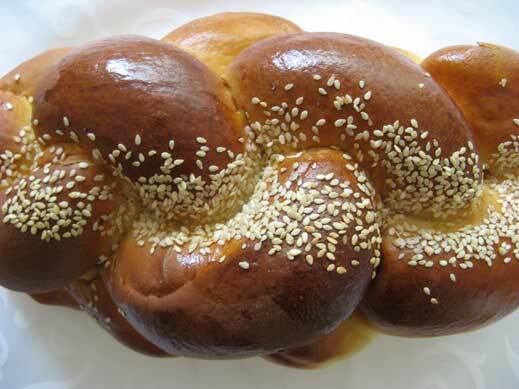 Challah is a braided egg bread which is soft, moist and flavourful. I think that the best challah in Toronto is from Harbord bakery. Harbord Bakery is one of the oldest Jewish bakeries in Toronto; it has been open since 1926. Other tasty treats on my list from Harbord bakery include their sweet cheese buns and rugelach. Posted by Sam at 9:03 p.m. I especially love it because I had to miss my bread class last Thursday and part of the lesson was challah. I used to walk past the Harbord Bakery everyday on my way to class... sigh, I miss it. Nothing says Friday night more than a beautiful Challah - and that's a beautiful challah! The result was brilliant and as I recall, it looked pretty much like the one from Harbord bakery.